Marco Clark traveled to southwest China to study the effects of dam construction. Marco Clark’s expedition to the Nu River Valley in southwestern China was off to a difficult start. Checkpoints lined the highway, blocking access to villages near the Nu, where there are plans to construct as many as thirteen dams. Even though Clark needed to get to the villages to do his research, he was reluctant to approach the checkpoints. This challenge came as no surprise to Clark; his prior experiences in China had taught him to expect the unexpected. Still, he was nervous about the sensitivity of his research topic: human behavior in the face of an immediate environmental threat. But Clark continued to trek — mostly by bus or foot — approximately 230 miles up the Nu River Valley in search of an accessible village. 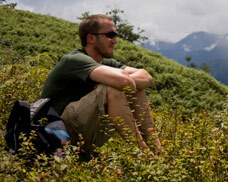 Clark’s research is associated with a cross-disciplinary project at OSU that unites the departments of Biological and Ecological Engineering, Anthropology, and Geosciences in order to examine the social, economic and ecological effects of dams on the Nu and Upper Mekong Rivers in China. Currently, China is the international leader in dam construction, and the project is being developed with the intent of assisting China in their quest for renewable energy. Clark’s interviews with villagers and political leaders will provide a better understanding of the effects of dam construction on people and the environment. 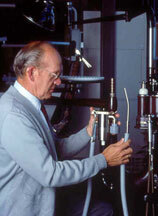 As an undergraduate studying political science at OSU, Clark developed an interest in human behavior. “I wanted to study how people feel about their environment and how they respond when that environment is threatened,” Clark says. Clark had visited China three times while pursuing an International Degree and was inspired to return. Currently in his second year of graduate study in anthropology, Clark was able to conduct more fieldwork in China with the help of a generous grant from the Institute for Water and Watersheds (IWW). Clark improvised as he neared the Tibetan border, hiking two hours from the main road until he happened upon a privately owned dam under the support of the provincial government. The dam, near the village Dimaluo, was still undergoing construction when Clark came upon it. “The community was very removed and felt more secure,” Clark says. “It felt like a suitable place to be.” Dimaluo was where Clark would conduct his research. While in Dimaluo, Clark was greeted warmly by the community. He formed a lasting friendship with a man named Aluo, who invited Clark into his home to stay with his family. Aluo assisted Clark with his interviews in exchange for English instruction and help translating for foreign guests. Clark hopes that his research will help other scientists and policymakers better understand the potential impacts of dam construction, including the displacement and resettlement of villagers. Clark is still deciding what to do after he receives his degree from OSU in 2009. He is thinking of pursuing a Ph.D. in order to teach and continue researching at a university. He is also thinking of continuing developmental work for either a governmental or non-governmental organization. Posted in Environment and Natural Resources, Social Science. 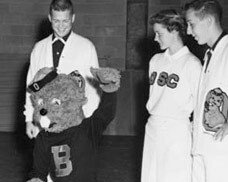 When Ken Austin was chosen to be Oregon State College’s first Benny Beaver in the spring of 1952, his budget was less than $100, and he had no costume and no notion of what a student mascot would do at a football game. After all, at the time, only two other Pac-8 schools — Cal and Stanford — had live student mascots, and Austin had never attended their games. So he took his meager funds to a costumer in Portland, who fashioned him a tail and a head made out of papier-máché, and covered both in brown shag carpeting. He drew inspiration from the clowns at the St. Paul Rodeo near Newberg, Ore., where he grew up. And then he performed. During Beaver football games, Austin went wherever the action was. He once climbed onto the goalpost to taunt an approaching Stanford offensive line — until the referee threatened to hit the Beavers with a 15-yard, unsportsmanlike conduct penalty. Austin encouraged the Tail Flappers — the men’s cheering section — to be louder, and got the Beavers’ crowds to laugh. As a student, Austin loved participating in Oregon State’s homecoming traditions, namely the bonfire and the noise parade. His ambition, he says, was to build the loudest float in the parade, and he usually succeeded. In his first year, he borrowed Newberg’s air raid siren and hitched it to a trailer. The following year, he built a cannon, which he and his fraternity brothers from Delta Tau Delta shot off during the parade. entrepreneurship students live. Both Ken and Joan were inducted into the College of Business Hall of Fame in 2003. Posted in Students and Campus Life. OSU’s freshmen take part in the annual New Student Walk and Convocation. It was an ideal day for a walk. The sun made an entrance from behind the clouds and shined on more than 1,500 incoming OSU freshmen, who were gathering in the MU Quad in preparation for the annual New Student Walk and Convocation. The symbolic march to Gill Coliseum mimics the one they will make to their commencement in four years, when they become the Class of 2012. Attendance at the New Student Walk has risen every year; however, this year’s turnout is estimated at an all-time high of 1,800 students, friends and family members. The Walk is coordinated mainly by staff members of New Student Programs and Family Outreach (NSPFO), with additional help from faculty, staff and student volunteers. “The whole campus comes together to organize CONNECT Week,” said NSPFO director Kris Winter. There was a sense of anxiety and anticipation in the Quad as the students prepared to march — some fidgeted nervously while others rapidly discussed living arrangements and class schedules on their cell phones. They were supported, though, by faculty members representing the degree programs they teach for, upperclassmen who came to see the event, close friends and parents. As the students filed into Gill, they were greeted with cheers, chants and applause. “I thought it was pretty cool to have the upperclassmen out there,” said Randy Solanksy, an electrical and computer engineering major. Among the incoming freshmen, there are 89 different majors declared; 125 students have been accepted into the University Honors College; and 166 were ranked first in their high school graduating class. At Gill, new students heard from Larry Roper, vice provost of student affairs; keynote speaker Peggy McIntosh, founder and co-director of the National SEED Project on Inclusive Curriculum and the associate director of Wellesley Centers for Women; and OSU President Ed Ray. “If you get engaged in things that inspire you, the odds of graduating go up drastically,” Ray told students. 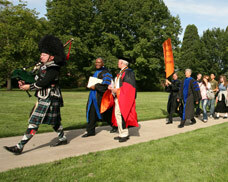 Students weren’t the only ones participating in the walk and convocation. Many parents and families joined them as well, including Katina Atz, whose daughter is an incoming business finance major. The Marshall siblings are pursuing degrees at OSU at the same time. If you asked the Marshall siblings a year ago if they could see themselves attending Oregon State University at the same time, they would have laughed at you. It seemed so unlikely. At 29, Nikki Marshall is ten years older than her brother, Mike, and 6 years older than her sister, Kerianne. They never even attended the same high school at the same time. But in 2008-09 all three Marshall siblings will overlap as OSU students. Nikki is starting her fifth year working toward her Ph.D. in microbiology . Kerianne is in her second year earning her master’s in merchandising management, and Mike is starting his first year, with the intention of majoring in marketing or management. “This is our only year together, and we’re looking forward to making the most of our time,” says Kerianne. Although they are pursuing different fields, the factors that enticed the Marshalls to OSU were the same, namely a love for Corvallis and OSU — and Beaver tailgating. 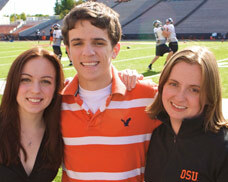 Kerianne wasn’t sure she would stay at OSU when she started as an undergraduate in 2003. But she joined the Delta Gamma sorority as a freshman, moved into the house and found a support system that helped root her at OSU. She liked having her family nearby, and liked her familiarity with OSU — the Marshalls have lived in Corvallis since 1991. Her transition from an undergraduate education to an advanced degree at OSU was seamless. She graduated in 2007 and started master’s degree classes that fall. Both Nikki and Kerianne are hoping that Mike will have an undergraduate experience that was as positive as theirs. “I want him to find the right club or organization that will help him meet people and have a great time,” Kerianne says. Mike seems ready to do that. He’s excited about playing intramural sports —soccer, golf and volleyball, to name a few. Although Mike had the opportunity to go to school in Boston, where his parents are from, or Seattle, he picked OSU. “I sat down and thought about it and decided, ‘I like Corvallis,’” he says. All three are anticipating the fall tailgating season, which has been a family tradition since 2002.“ Everything’s usually scheduled around the game,”says Mike. They’ve rarely missed one. Their family has held season tickets since 1999, and they can remember Reser Stadium when it was still called Parker Stadium. They each have their favorite moments — Nikki’s and Kerianne’s when OSU beat USC in 2006; Mike’s is the 2004 “Fog Bowl,” and OSU’s near-victory over USC. 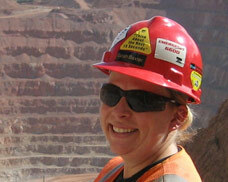 OSU’s Sarah Baxter begins a career in exploration geology. When Sarah Baxter told her father she was going to study geology at Oregon State University, he gave her one of his prized possessions, the rock hammer he had used as a mining engineering major at the University of Nevada, Reno, in the 1960s. She was so touched that she won’t take the hammer with her on field trips for fear of losing it. OSU certainly didn’t disappoint her. Within two weeks after starting she had met professor John Dilles, who would foster her interest in mineral deposit geology throughout her time at OSU. The first time they met, Dilles invited Baxter on a field trip to the French Gulch mining district in Shasta City, Calif. Dilles, Baxter remembers, bought all the groceries and invited her to stay in his family home. The experience cemented Baxter’s first impression of OSU as an institution that invested in its students. “John Dilles is world-renowned in mineral deposits. I wouldn’t have gotten that had I gone elsewhere. I didn’t need to go to a mining school because I had the best at OSU,” Baxter says. In her French Gulch study, Baxter tried to determine the geological conditions that favor the presence of gold deposits. More specifically, she wanted to see how many parts per million of gold were “trapped” in sulfide minerals, such as pyrite and arsenopyrite, that were present in the host rock quartz veins. She collected rock samples from various areas at the French Gulch mine, choosing the samples with the highest probability of having sulfide minerals associated with “free” gold. Baxter sliced the samples into thin sections and analyzed their texture and mineralogy. 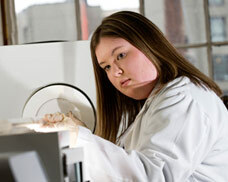 She completed chemical analysis of the minerals at a lab in the College of Oceanic and Atmospheric Sciences. The idea was to see whether the samples she took were similar to others around the world where “trapped” gold could be found. Although Baxter’s conclusions did not support this idea, she collected valuable data about how the minerals in her samples were formed. Posted in Environment and Natural Resources. Aquatic ecologist Christina Murphy is heading to Chile on a Fulbright grant. It was a frigid winter night on Chile’s central coast, and Christina Murphy was standing in the surf in her wet suit with a night vision monocular, getting pummeled by waves. She was counting her research subjects — nocturnal, carnivorous crabs of the species Acanthocyclus gayi that hide in algae or rock crevices — unaware that she would later regard the experience as one that cemented her love for her work. It was, however, an unsurprising revelation — Murphy has wanted to be a scientist since the age of six, and has never question that career path. Murphy has pursued her goal throughout her education and has seized opportunities to focus on it at Oregon State University, where she was an IE3 Global intern in Chile and performed reseearch on the coastlines of Washington, Oregon and the Galapagos Islands. Now Murphy, who earned University Honors degrees in biology, fisheries and wildlife and international studies , is planning to use her research and international experience as a Fulbright scholar. The idea, Murphy says, is to understand how large oceanographic processes, like upwelling, can affect the habitat in which predators live. More upwelling, which brings nutrient-rich water to the surface, means that the crabs’ algal habitat will grow long. “You can tell how conditions that are coming from the bottom up, like upwelling, influence top-down effects, like predation. We can help put together a model that will extend to large coastal areas and get a bigger picture,” says Murphy. Murphy will focus on more than her own research when she is in Las Cruces. She plans to mentor local high school students who might not otherwise have the opportunity to do hands-on work with a scientist. “It’s great to get to help someone in the field,” says Murphy. Her knowledge of U.S. pop culture, like the band My Chemical Romance, helps her earn points with the Chilean teenagers, as well. Murphy credits the international and research opportunities she had at OSU, as well as an engaged faculty, with helping her develop as a scientist and a citizen. “The willingness of OSU faculty to work with undergraduates is unusual. It makes the difference between a lackluster education and a future for someone,” she says. Current and former OSU student-athletes head to the Beijing Games. From Aug. 8-24, the world’s attention will turn to Beijing, China and the 2008 Olympic Games. Five current, future and former Oregon State University student-athletes will be making the trip and trying for gold. “We are very proud of our extraordinary student athletes and alumni who are participating in the Summer Olympics, and we know they will represent Oregon State University well in every respect,” said OSU President Ed Ray. 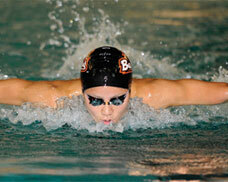 Read more about our Beaver representatives and how they made it to Beijing. Barnes, a junior business administration major, headed to Tunisia in March to compete in the FILA-African Senior Continental Championship at 66 kilograms (roughly 145.5 pounds), defeating three opponents to take the title and the automatic berth to Beijing. Barnes’ competition begins Aug. 20. Haruguchi, a junior majoring in human development and family studies, took a break from her studies at OSU after the winter term to train in Japan. 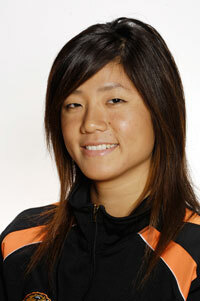 “I am so excited to practice with the national team for Beijing,” she said. Although Australia has never won an artistic gymnastics medal, Liddick believes her team has the talent and depth to make history in Beijing. To find out more about Olivia Vivian’s journey to the Olympics, check out her blog. Former OSU infielder Brian Barden was one of 23 players named to the 2008 USA Baseball Olympic Team, making him the first Beaver baseball player to compete in the Olympics. Baseball competition is scheduled to start Aug. 13 and conclude with medal games on Aug. 23. Currently with the Memphis Redbirds, a St. Louis Cardinals affiliate, Barden has played in 89 games this season and is batting .303 with nine home runs and 34 RBIs. Barden, a native of Templeton, Calif., was drafted in the sixth round of the 2002 Major League Baseball First-Year Player Draft by the Arizona Diamondbacks. 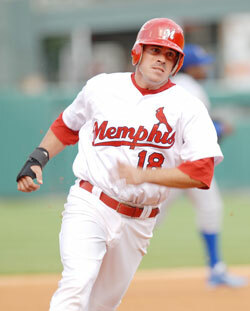 He was one of three Beavers who made their MLB debuts in 2007. He appeared in eight games with the Diamondbacks and 15 with the Cardinals. 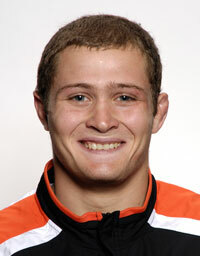 Inman, the 2005 U.S. Rowing Male Athlete of the Year, lettered on the varsity crew at OSU from 2000-2002. He led the Beavers’ varsity-8 to a fourth-place finish in the 2002 Intercollegiate Rowing Association National Championships in New Jersey, the highest finish ever for OSU. 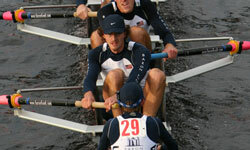 Update: Josh Inman and the U.S. men’s eight won Olympic bronze on Sunday, August 16 in Beijing. Inman and his teammates finished in 5:25.34, behind gold medalists Canada and silver medalists Britain. Former OSU soccer star Robbie Findley is an alternate for the U.S. Soccer team this summer in Beijing. Findley was the first Beaver soccer player to be named First Team All-Pac-10 three times, and he finished his four-year collegiate career with OSU as the school’s third all-time leading scorer with 28 goals. Findley is the starting striker on the MLS team Real Salt Lake. Oregon Middle School Students Get an Astronaut’s Education. If middle school students don’t seem likely to devise a spacecraft that could bring humans to Mars, or a module that could support a crew of four to travel and live there for 700 days, think again. Forty-eight Oregon middle school students from underrepresented and underserved populations are currently using creative teamwork and their knowledge of Earth systems to solve those problems at this year’s Oregon ExxonMobil Bernard Harris Summer Science Camp at OSU. The classes students are attending throughout the two-week residential camp are helping them prepare for these tasks — they’re learning about the interrelationships of calories for energy, plant production, soils, living things, water and landforms, habitat components and solar energy. Competition to get into the camp is stiff — more than 400 students who are entering grades 6-8 applied to earn a spot — and students come from 21 of Oregon’s 36 counties. The idea, says the camp’s executive director Virginia Bourdeau, is to follow kids who have been in the program throughout the rest of their schooling. Do they take more math and science courses after attending camp? Do they go on to college? “The camp is an opportunity for students to come and say, ‘I can do this.’ If they have a positive experience, they’ll come back to a university when they’re 17 and 18,” Bourdeau says. 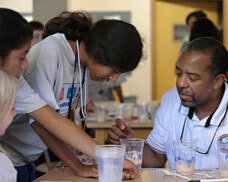 Bernard Harris, the first African-American astronaut to walk in space, visited the camp on Aug. 7. He founded the Bernard Harris Foundation in 1998 to develop math/science education and crime prevention programs for America’s youth. The camp is the result of a grant from the ExxonMobil Foundation and the Bernard Harris Foundation, as well as the effort of OSU’s Extension 4-H Youth Development; College of Education, Science and Math Investigative Learning Experiences (SMILE) program; Department of Science and Mathematics Education in the College of Science; and College of Engineering. To follow the students’ progress, check out the Science Camp blog. Posted in Engineering, Schools and Education, Science. Anna Putnam uses nanotechnology to create a revolutionary battery. In the three years since that rude awakening, nothing less than an A has darkened Putnam’s grade report. She has gone on to collect scholarships like most students collect songs on their iPods. The American Engineering Association Scholarship from Intel and OSU’s Presidential Scholarship are among them. Now, Putnam has advanced from the front of the class to the front edge of innovation, where chemical engineering meets nanoscience and “drop-on-demand” printing technologies. 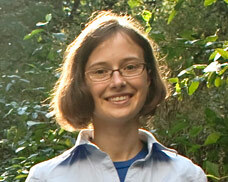 Read more about Anna Putnam and her undergraduate research in the Summer 2008 issue of Terra. Posted in Engineering, Science, Students and Campus Life. 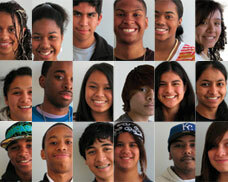 OSU and The Oregonian host the Newspaper Institute for Minority High School Students. This June, Oregon State University and The Oregonian invited 18 high school students to the OSU campus to take part in the Newspaper Institute for Minority High School Students. The Institute had been a longtime dream of Frank Ragulsky, OSU’s director of student media, and a grant from the Ethics and Excellence in Journalism Foundation in Oklahoma City made it possible. The teenagers, who are all from Oregon or Washington, spent a week reporting for and producing their own newspaper, The Pride. They also delved into new media — blog posts, video and photos — that chronicled their experience. For more about the students’ and camp counselors’ stories, experiences and work, visit the Oregonian’s Journalism Camp 2008 blog. Photos courtesy of The Oregonian. Posted in OSU People and Programs, Schools and Education.